Thanksgiving is one of my favorite holidays, giving all of the justification necessary to indulge with reckless abandon in some hearty and flavorful dishes. In the days after Thanksgiving, it's always enjoyable to get creative with the leftover turkey to ensure that turkey fatigue doesn't set in. 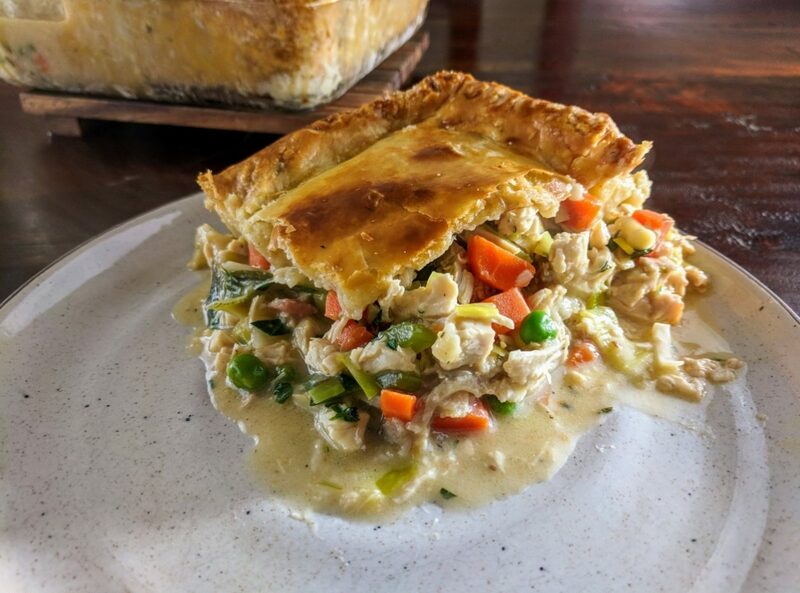 This turkey pot pie dish pulls together all of the remaining scraps of turkey and amplifies it with an herb infused gravy that house some sauteed vegetables. It is all wrapped together in an all butter crust that is flaky and savory, and keeps great for leftovers for the week! Make your favorite pie crust recipe, I use Hoosier Mama Pie’s all butter crust (See Recommended Products). Divide into ⅓ and ⅔ portions and let rest overnight in the fridge, as well as the baking dish that has been lightly buttered and floured. I use an 8 inch by 8 inch square glass dish. I add fresh herbs to the crust for a more savory alternative, I used about a teaspoon of both sage and thyme. Pour 1 and ¼ cup chicken broth over the turkey and set aside. If the leftovers are already moist, the stock may need to be pulled back to 3/4 cup to 1 cup. Heat olive oil over medium heat in a dutch oven or large stock pot until shimmering. Cook pancetta if using for 3-4 minutes, until crispy. If not using pancetta, add leeks, celery, and carrots. Season to taste with salt and pepper. Cook until the vegetables are soft and translucent, about 8 to 10 minutes. Add the vegetables to the turkey that has been set aside in the stock. In the same pot, melt the butter and the add the flour, whisking until smooth. Cook this mixture, stirring constantly, until the raw flour aroma has dissipated and the flour mixture is a golden blonde color, about a minute. Next, slowly add ¾ cup of the chicken stock and then the 1 cup of milk while whisking constantly to ensure no lumps. Make sure to scrape up any bits that have accumulated on the bottom of the pan. Cook until the mixture is smooth and comes to a boil. Remove the mixture from the heat, and add in the bowl of sauteed vegetables and turkey. After this has been combined, add in the parsley and thyme, then the frozen peas. Taste for seasoning and add additional salt and pepper. Cover the mixture and chill in the refrigerator until just cool, about one hour. Preheat the oven to 400 degrees F and place a baking sheet in the oven, preheating the oven for around 45 minutes. While the mixture is chilling, remove the pie dough from the fridge and allow to warm up at room temperature for about 20 minutes. Roll out the ⅔ disc first, and place it into the 8x8 dish that has been cooling in the fridge. Next, roll out the ⅓ disc and place it gently in the fridge until the one hour mark is up on the filling. Fill the crust with the cooled filling and place the smaller piece of dough on top of the mixture. Press the edges together and crimp with a fork or another method based on your preference for pie presentation. In a small bowl, whisk egg yolk and remaining two teaspoons of milk. Brush the mixture over the top of the crust and on the crimped edges. Slice a few decorative vents of the crust and transfer to the preheated baking sheet, but line it with parchment paper in case the mixture boils out of the slits. Reduce the heat to 375 degrees F and bake until the crust is deep golden and the filling is hot (140 degrees, test with a thermometer if need be), for about 70-80 minutes. Rotate the pie every 15 to 20 minutes and cover with foil if it begins to brown too aggressively, this normally happens after about 45 minutes. If the bottom of the pie is still pale in color after about an hour, remove from the baking sheet and place directly on the oven rack. If storing any leftovers, remove any excess liquid and transfer to a storage container to reheat separately and to ensure that the crust doesn’t get soggy while resting in the fridge.